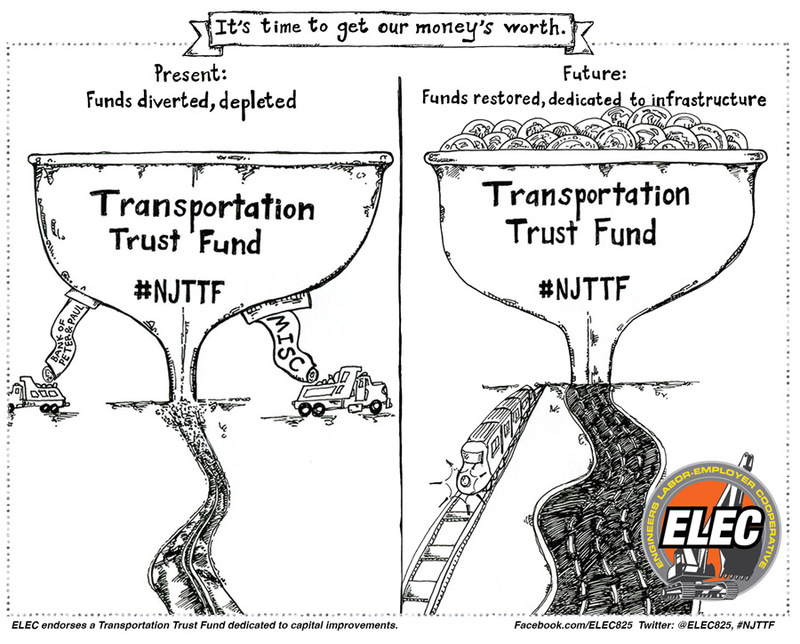 For years, the state of New Jersey had a dedicated, reliable source of infrastructure funding, the Transportation Trust Fund (TTF). But the TTF has been funded with Band-Aid bonds that are now due and used like a piggy bank–funds siphoned off to plug budget shortfalls elsewhere. The result? Less money spent on building and maintaining roads and bridges and mass transit. You feel it with every pothole and every traffic jam. You feel it with lackluster economic growth. And now, at a time when our state's economy could use all the help it can get, it's nearly bankrupt. It's time to find a long-term solution to the Transportation Trust Fund and to patch all the dodgy accounting and wasteful loopholes so that the TTF is dedicated to capital improvements. Dedicated to better roads, better bridges, better mass transit, and a better New Jersey economy. It's time we got our money's worth. ELEC is the Engineers Labor-Employer Cooperative, a unique collaboration between labor and employers pursuing the same goal–economic development and infrastructure improvements that spur the regional economy and job growth, not just for the construction trades but for everyone that lives and works in the region.